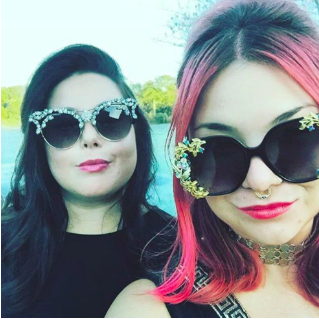 When two badass babes were randomly paired together in the FIT dorms, they could never know they were about to embark on a decade of adventures fueled by their love of vintage and sparkle. Co-founders Keriann & Angela revive unloved vintage by hand adorning their one of a kind finds with treasures found on their journeys, staying true to their mission of sustainable fashion and radness. Who could know that a random rap battle followed by a late night of NYC debauchery would bring them a PR angel in the form of Janae. Joining the House in 2018, Janae makes sure that the world can see all the HOC awesomeness. HOC runs on the idea that sustainable and ethical fashion is the only way to accessorize. We proudly source vintage and much loved items for our swag - and travel around the country to source the best from the bad babes that came before us. We love street fairs and often travel to new cities, constantly being inspired by the amazing people and experiences we get from the road. We brake for estate sales and never miss a good thrifting opportunity. House of Correia has proudly shown at legendary venues/markets such as Renegade, Capsule, BUSTcraftacular, Schwick Markets, The Empire Hotel, Chelsea Room, Webster Hall, Stage 48, and have been featured at many other rad NYC events.